The ancient Greeks and Romans developed the olive oil making process thousands of years ago. The best olive oil still goes through a similar process where the olive is gently crushed and pressed to extract the oil. First the olives need to be picked, either by hand or with a machine that gently shakes olives loose from the tree. Next any extra debris that came loose during the harvest will be removed from the collected olives. This step is incredibly important in the olive oil making process, as olive leaves have a highly acidic taste when crushed. The olives will then be cleaned typically within 24 hours from when they were picked. If the olives are not cleaned properly this can greatly affect the final taste of the olive oil. Next the olives will gently be ground into a paste by a giant rotating stone, called an olive press. Many of these stones are made from granite that has been specifically quarried for this very purpose, as it has been for many centuries. 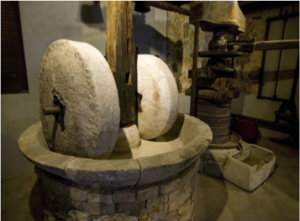 This method resembles the exact original process, aside from the fact that mules or oxen would have been used to rotate the stone, but have now been replaced by electric operated motors to turn the giant stones. Following the grinding phase, the paste is spread into thin layers on mats, which are then stacked on top of one another for pressing. The mats are stacked several feet high onto a metal post that is then placed into a large hydraulic press. As the press slowly begins to put pressure on the stacked mats, olive oil and vegetable water is released. When no heat is used to extract the oil, this process is called “cold pressed.” There are several other processes, which do utilize heat to extract the oil, however this often kills important antioxidants. Finally the vegetable water is removed from the oil. Olive oil that is created from olives harvested early on in the season has a much stronger taste and can be combined with the older, mellower tasting oil from the olives gathered later in the season. This helps to create a well-bodied, balanced flavor that the typical pallet will enjoy. Olive Oil: It’s Good for the Brain!